Determining the value of rehabilitation, maintenance costs and overall energy benefits requires a process that provides a comprehensive appraisal of the building. A formula would be helpful in determining the known and unknown conditions particular to a building’s embodied energy. Is such a thing possible? In the case of a landmark building, we must determine its significance, integrity and context. Historic significance is the importance of a site to noteworthy events, people, or periods. Historic integrity speaks to the authenticity of a building or site identity, i.e., physical material remaining from a period of significance. Historic context sets the scene for the building or site based on events and trends. 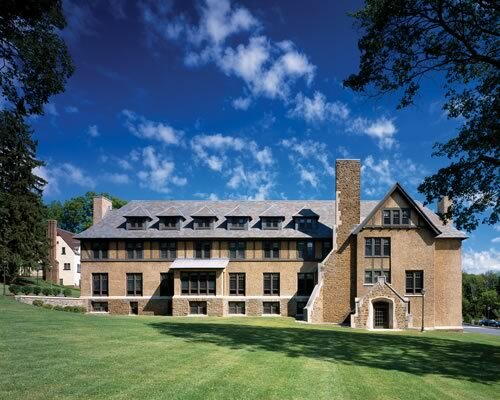 Preservation sustains the existing form, integrity and materials of an historic property. Restoration accurately depicts the form, features and character of a property as it appeared at a particular time by removing features from other periods in its history and reconstructing missing features. Rehabilitation creates a compatible use for a property through repair, alterations and additions, while preserving those features that convey its historical, cultural, or architectural values. Reuse retains a majority of a structure, but redesigns it for a new use. Rehabilitation and reuse allow more flexibility, but the owner must find a balance between the significant features and maintaining a profitable and viable building. Fortunately, many jurisdictions provide tax credits – that can make or break a rehab project – to encourage continued use of old buildings. Stone clad structures built before 1930 are good candidates for rehab and reuse because the stone is thicker and, if there are no other significant condition issues, it is more tolerant of repair. Similarly, the cladding systems for stone in older buildings typically are connected with lower-grade metals of a greater thickness and increased tolerance allowances. When these connections rust or fail there often is more room to work a new solution to stabilize it. By contrast, mid-century technological advances in equipment permitted thinner slabs, often making stone initially less costly, but harder to repair and less durable with closer tolerances for installation. Both types of challenges are surmountable with a varying vocabulary of solutions. Before owners can decide how to modify buildings, they need to assess the amount of embodied energy balanced with the structure’s operating energy, that is, long-term costs and authenticity of material with daily costs to run the facility. Embodied energy is the labor and energy consumed in the production of a building, from the harvesting of natural resources, to the fabrication and delivery of materials, to the installation of these materials and products. At the other end of the building spectrum it includes the energy to demolish and remove building components. Embodied energy is a “cradle to grave” view, and is particularly high in masonry buildings where the energy used to quarry, transport and install is compounded by the natural energy use over eons in the formulation of stone. Operating energy is measured easily because it includes the energy for heating, cooling, ventilation, lighting, equipment and appliances. The balance between embodied and operating energy often involves whether you choose to retain the original exterior walls, roof and windows of an older building. This is a dilemma, especially concerning structures designed in the heyday of modern architecture, when conservation and energy use was not an issue, and concrete, steel and glass were the materials du jour. It is expensive to heat and cool an early glass building, but if you tear it down you lose the investment in embodied energy and possibly historical significance. Masonry buildings are a safer initial and ongoing embodied energy investment. Universities have become increasingly adept at documenting the expenses of their buildings. 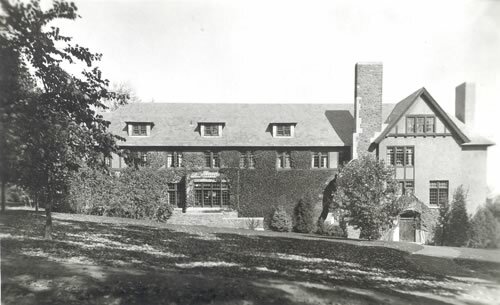 A few years ago, Hamilton College in Clinton, N.Y., researched carefully the benefits of renovating an 84-year-old stone and stucco-brick residence hall, Skenandoa House. 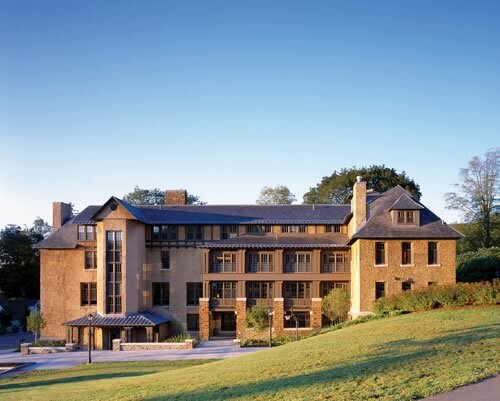 Balancing the embodied energy of the historic building with the operating energy it was costing, they chose to reuse the historic structure and install a geothermal heating system. The renovation was completed in 2004, and the geothermal system is anticipated to reach a payback point in 2009. Benefits of the heating system were evident almost immediately, however. In its first year of operation, the geothermal system used 250 percent less energy per gross square foot than a standard gas-fired heating system in a comparable residence hall. The geothermal system is incredibly efficient, particularly with stone and brick, which can be slow to absorb heat and cold. While conventional heating and cooling devices must convert outside temperatures to reach comfort levels, geothermal heating and cooling uses ground temperatures of around 55 degrees to help moderate the temperature differential. The process requires only electricity to run a heat pump and small circulation pumps, eliminating the use of natural gas. Another heating and cooling system would likely have included a significant amount of ductwork on the interior of the building, new perimeter fan coil units at each window and installation of multiple grills for supply and return air. Considering the requirements, a significant amount of demolition in the interior walls, including new steel lintels at each new opening and new ceilings to conceal the ductwork would have been needed. The mechanical space needed inside the building for the new air handling units was considered, but the primary consideration was given to providing as much space for students as possible. Exterior impacts likely would have included additional louvers and openings in the roof for air intake and exhaust, and rooftop or at grade cooling towers and chillers. These units not only require additional power and water, but also often require the design, labor and installation of additional structure for stability and accessibility for maintenance. All of these potential modifications would have affected the character-defining features of this historic structure. 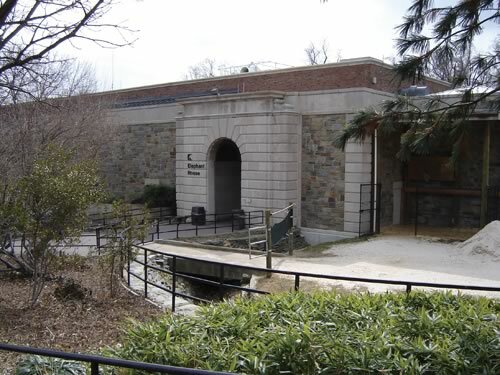 The geothermal solution used the existing radiator system and included a pump room requiring infrequent maintenance as it is connected electronically to the monitoring system in the college’s main facility plant. All of these components were identified, evaluated and assigned costs early in the design process. Thus, the implications of the selection in terms of new construction costs, value of original fabric and cost of demolition were understood at an early point in that process. The American Institute of Architects estimates that 75 percent of public buildings in use today will be ready for renovation by 2030. Of this percentage, a majority of existing public buildings has an anticipated life span of 50 to 100 years. Research indicates that embodied energy is as high as 10 to 15 percent of the energy used in the 100-year lifespan of a building, with this percentage decreasing as the building ages. Calculated with a lifecycle assessment scale, data on building systems and materials are being collected throughout the world. From multiple regions and resources, the Athena Institute of Ontario has created measurement tools that estimate demolition and disposal costs of walls, roof, windows, floors and structural systems. These numbers are critical in assigning value to a building’s embodied energy. To fully understand the ramifications of rehabilitation and the impact on embodied energy, one should include lifecycle assessments of building systems such as mechanical, electrical, plumbing and fire protection, as well as assessment of the building envelope, including exterior wall systems, windows, structure and roofing. Often, the cost and impact of demolition is overlooked in both demolition for a completely new structure and partial demolition for rehabilitation. Partial and total demolition expenditures also need to be included in the equation, including equipment, energy and landfill costs. Evaluating an existing building for reuse can be a complex balance of opposing values. Retaining existing building elements can save money and the quality of the original materials may exceed the current industry standards. Often, the elements that define the significance of a building are the components that ensure the highest embodied energy. Let’s look at some examples. Masonry, concrete and steel structures have a high level of embodied energy and can be evaluated for durability and possible new uses. Often, it requires a minimal amount of additional energy and financial investment to clean and repair an older stone because it was designed to last longer than modern cladding systems and rarely requires annual maintenance beyond pointing inspection and repairs. Seismic bracing can be a sizeable initial cost required for the continued use of historic structures, but this impact can be balanced with the initial energy and estimated lifespan of the structural members if the building has been properly maintained and not suffered traumatic damage. Many unsupported masonry structures or masonry-clad structures do not meet the current seismic requirements of applicable building codes. The existing, high level of embodied energy allows you to gain continued life and financial investment from the initial construction. Older masonry buildings not only can retain their historic significance, but also can provide continued value on the initial financial investment of the cladding system with modifications that bring the system into compliance. 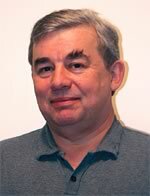 Establishing a cost/benefit timeframe that measures demolition and rehabilitation will tell you what you need to know. 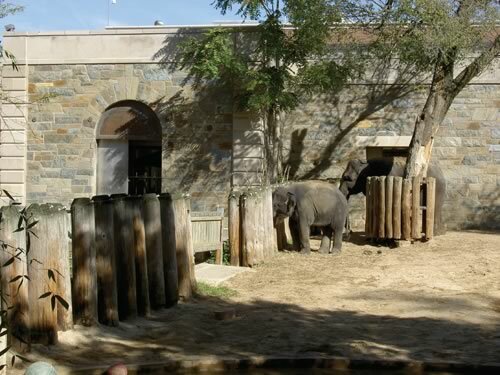 In the renovation of the Elephant House at the Smithsonian Institution’s National Zoological Park in Washington, D.C., seismic code requirements shook the historic, financial and functional viability of the project. During the evaluation phase, an issue arose regarding the building’s compliance with historic standards and modern life safety codes. 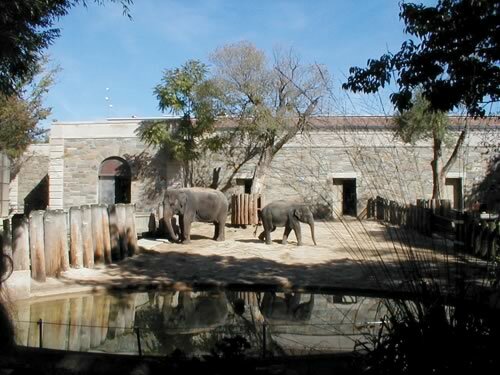 The perimeter walls of this 1937 animal habitat were built of a limestone and a rusticated stone infill system that included an interior clay tile wall with a cement plaster finish. The walls did not meet current seismic requirements for primary load-bearing structures. A range of modifications was explored, including demolition and reconstruction, installation of an interior steel structure and applications of materials to improve the lateral strength of these walls. The initial evaluation indicated that reconstruction of these walls would be necessary. This may have been the best economic solution to meet the seismic code requirements, but it would have been detrimental to the integrity of the exterior walls, which had not been modified since the original construction of the building. It was the calculation of the amount of embodied energy invested in the fabrication, transportation and installation of the materials in these original walls that completed the picture. It led the team to develop a hybrid solution that added a limited amount of steel in a manner that preserved the integrity of the historic fabric, complied with modern life safety code requirements and retained the additional embodied energy. This solution and the evaluation were proposed as an innovation credit since the project was pursuing LEED Platinum certification. Establish a cost/benefit timeframe to ensure accurate comparisons and a valid solution. This includes the assessment of continued life or function remaining vis-à-vis the cost of repair and maintenance. Verify the physical condition of the structure and the character-defining features to be retained if the building is historically significant. The solution should be tested for flexibility to ensure an extended lifespan. Evaluate the masonry support system to determine required repairs and modifications. The options should be evaluated for their durability as it relates to the remaining lifespan of the cladding system. Review the operating cost requirements because they are a significant contributor to the continued viability of a building and a sustainable solution. Establish a synchronized review that includes not only the physical condition but also considers historical significance, authenticity and regulatory requirements such as applicable building codes and standards. Evaluate the effort required to repair building systems to understand the scope of the project and evaluate the lifecycle of the materials. Quantify the range from complete demolition to partial demolition to understand the total project cost and impact on the existing structure. Gretchen K. Pfaehler is director of preservation for EwingCole in Washington, D.C. She serves on the board of directors for the Association for Preservation Technology International and is an associate member of the American Institute for Conservation of Historic & Artistic Works.